O'Heidia sin blogg: Sleeping on the moon :) A PFP challenge! Sleeping on the moon :) A PFP challenge! Stars and moon. 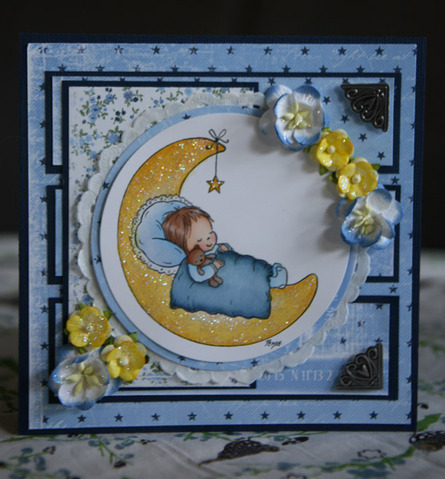 I have made a card using Penny Johnsons`s image "sleeping on the moon". This is a Stampvie-image and i think its super cute!!! Our sponsor this week is DigiStamp Boutique and Sally-Ann is generously offering one lucky winner a prize of 6 digi images of their choice from her store. By the way, i have made the card following a great sketch made by Marianne. If you visit Sketchy Colors you will find the sketch on the last challenge! Hei Heidi. Så nydelig dette kortet var. Motivet var jo bare så skjønt, og fargeleggingen din er helt super. Too cute ! Magnificent realization. Beautiful flowers. Wonderful work on your image. Bravo ! Adorable card - sweet image so perfectly coloured and I love the sparkle. Thanks for playing along at Charisma this week. Nydelig kort og veldig søtt motiv. Så nydelig kort du har laget, Heidi. Tar meg noen minutter til blogging idag, men har egentlig ikke tid. Scrapperommet tar form, litt paneling igjen og så maling!!! Så sees vi snart. Ønsker deg en fin uke.